Spring is upon us; it’s out with the dark evenings, warming stews and pumpkin spice, and in with the bright mornings, light nibbles and a selection of delicious, in-season vegetables. Searching for a new, light but tasty snack to share with your friends and family? 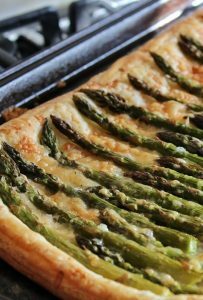 Why not try out our simple Asparagus Puff Pastry Tart recipe, a quick and easy way to enjoy freshly grown asparagus this Spring time. This green, speared vegetable is in its prime from April to June, with bunches available as early as March if the weather has been favourable. Not only is it versatile, tasting great when boiled, roasted, steamed or grilled, it’s also packed with health benefits and is low in calories (Approx 20 calories for half a cup). 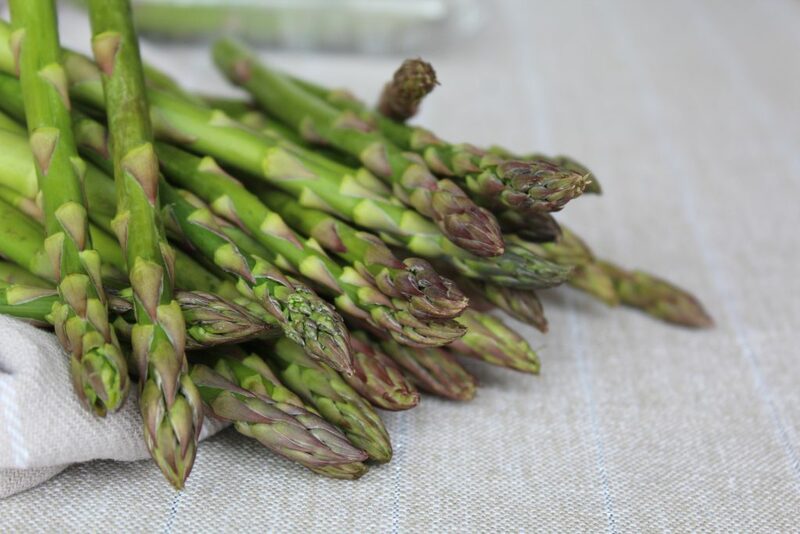 Asparagus spears are a great source of vitamin C and K, meaning they can help to boost the immune system and promote healthy blood clotting for healing wounds effectively. Eating the vegetable is also said to promote healthy bacteria which in turn can help reduce bloating. 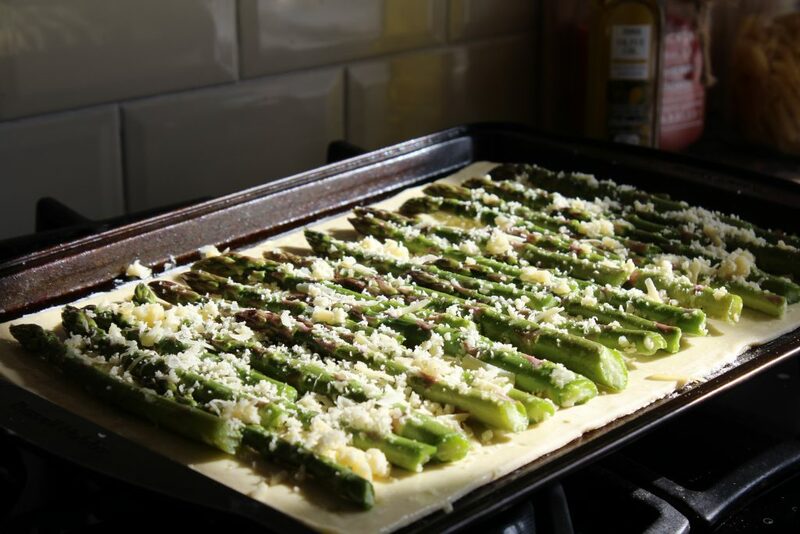 In addition, asparagus is high in folate, a nutrient that is vital for a healthy pregnancy and many other functions in the body, including cell growth and DNA formation (*). 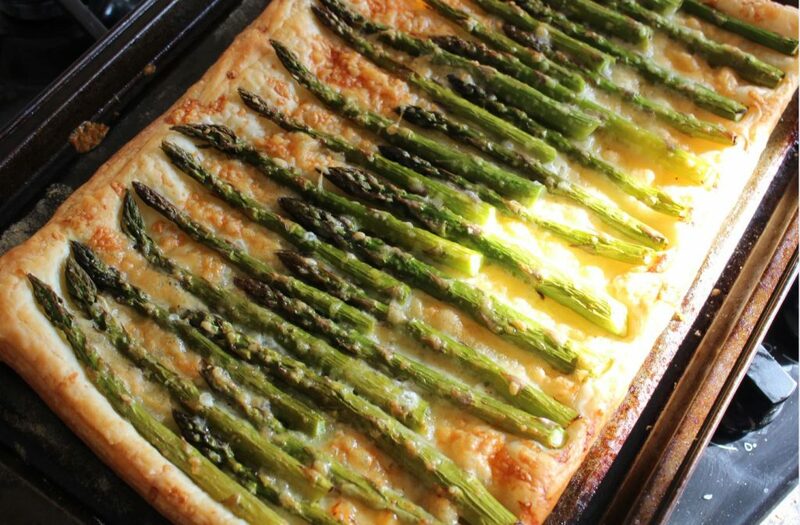 Crispy and cheesy, this tart is the perfect way to turn your fresh asparagus into a picnic-style snack, ideal for brunch or a Spring treat the whole family will love. Sprinkle flour over a clean work surface and unfold your puff pastry on top, ensuring the bottom surface area is lightly coated in flour- this will work as a natural lining to prevent your pastry from sticking to a baking tray. Next, transfer the pastry to a baking tray (large enough so that your pastry sheet doesn’t fold up at the edges), and brush the top surface area with olive oil (1 tbsp). 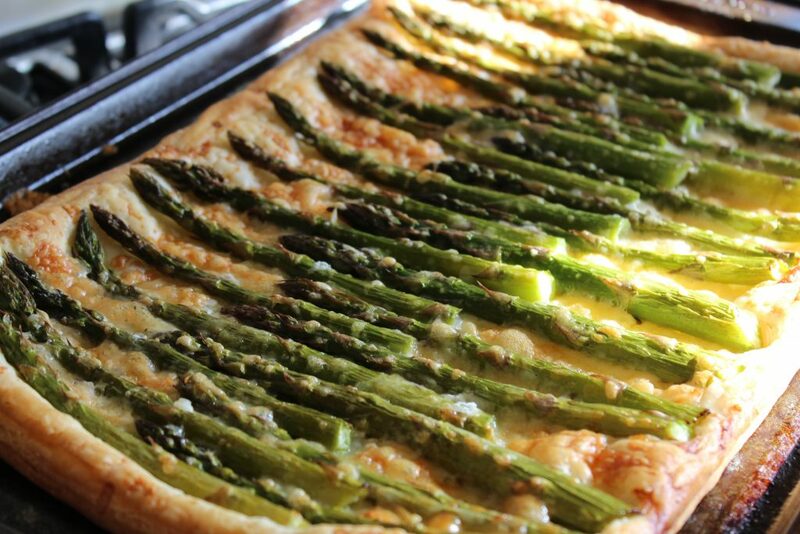 If needed, trim down the ends of your asparagus to get rid of the wood-like texture. Pop your spears into a mixing bowl, along with your remaining olive oil, rock salt, pepper and half of the Gruyere. 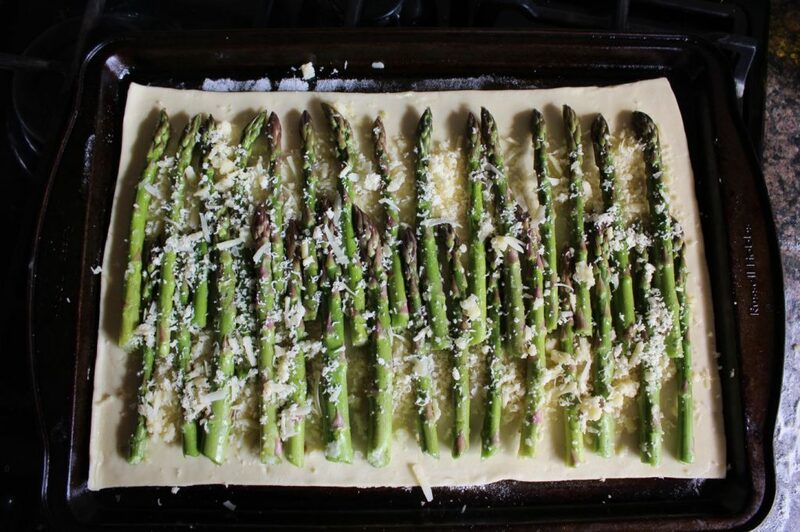 Toss together or use hands to fully coat the asparagus. 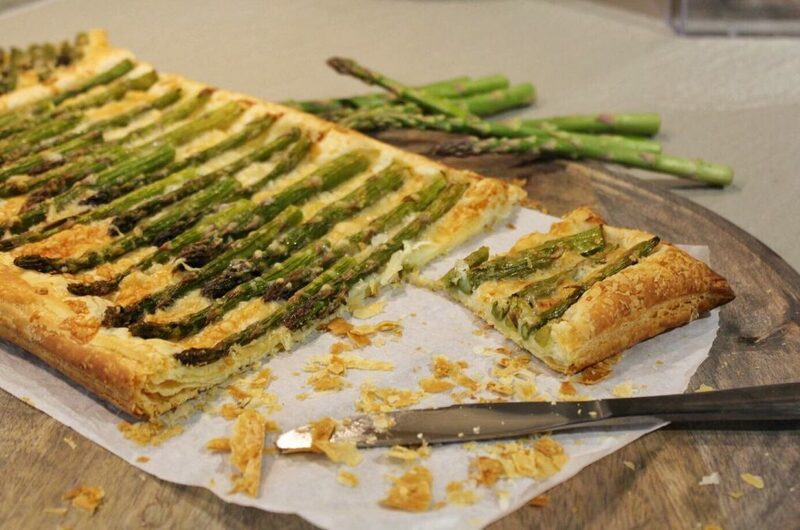 Next, place your asparagus in a single layer on the pastry, leaving a small margin around the edge to allow for a defining crust and to make it easier to hold when eating! Sprinkle any remaining olive oil mixture from your bowl across the top, along with the remaining cheese to taste. Bake your tart for 20 to 25 minutes. Pastry should be golden brown and your cheese should be melted. Make sure to leave your oven closed for the first 75% of the bake to prevent the pastry losing its height. When the tart is baked to your liking, cut it into even pieces (4 by 2 if you want each piece to have a crust, but can also easily be 4 by 3) and serve warm or cold. The pastry will keep for a couple of days in the fridge after baked, so it’s a perfect lunch box snack or picnic nibble. pictures with us on social media!